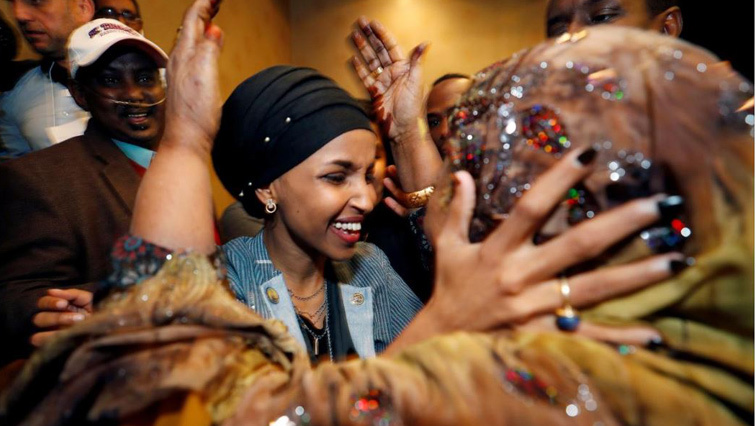 Somali residents celebrate Ilhan Omar's election to US Congress - SABC News - Breaking news, special reports, world, business, sport coverage of all South African current events. Africa's news leader. Democratic congressional candidate Ilhan Omar is greeted by her husband’s mother after appearing at her midterm election night party in Minneapolis, Minnesota. Residents of the Somali capital Mogadishu have celebrated the historic win of Ilhan Omar to the US Congress. The former Somali refugee became the first Muslim woman to be elected to Congress on Tuesday. She says she draws her inspiration from her journey as a refugee in Kenya’s Dadaab refugee camp in the 90s. In Kenya, Omar’s victory sparked heated debate on social media, with some criticising Kenya’s treatment of Somali refugees. While Kenyans on twitter congratulated Omar, their Somali counterparts berated them for what they termed as Kenya’s restrictive refugee policy. In her native Somalia, residents celebrated the win. About a quarter of a million Somali refugees live in Kenya’s Dadaab camp under tough conditions, which include regular police harassment, overcrowding and reduced food rations. She told Reuters News Agency in an interview that her journey from Somalia is her inspiration. “As an immigrant you know I understand and love this democracy in a way that only someone who has experienced the absence of it could,” says Omar. While Omar is living the American dream, many young Somalis like her are still in refugee camps in Kenya and the East African region, for some that dream was shattered after President Donald Trump’s administration barred arrivals into the US from seven majority Muslim countries including Somalia. This entry was posted on 08 Nov 2018,05:20PM at 5:20 PM and is filed under Africa, Homepage Featured Story Slider. You can follow any responses to this entry through the RSS 2.0 feed. Both comments and pings are currently closed.